Enonic Market is the marketplace for sharing apps, libraries and starter kits for Enonic XP - the web operating system. Enonic XP combines four traditional systems in one: Application Server, Search engine, NoSQL storage and Web CMS. It is a highly scalable and modern platform for building enterprise class web applications and sites. Apps, libraries and starter kits? 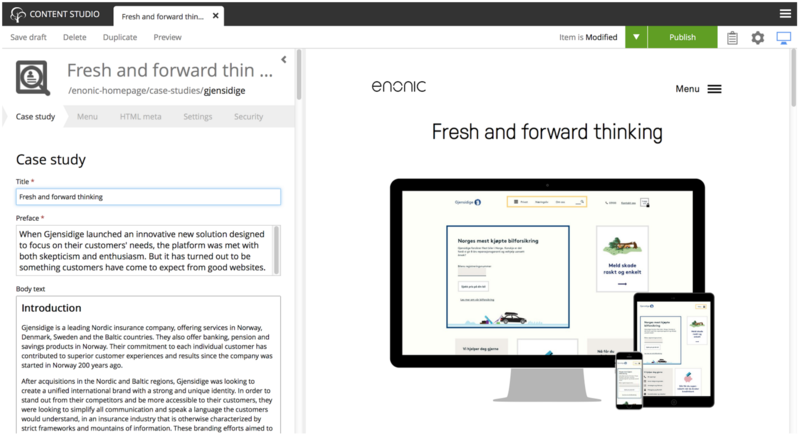 Enonic Market features three types of content; applications, libraries and starter kits. An application is a ready-to-use app that can be added to your Enonic XP installation. As an example, try the Superhero Blog app which is a fully featured blogging application. Technically, libraries are very similar to Applications, but the main difference is that a library cannot be installed and started by itself. A library is used as a part of an application, in order to speed up development and re-use of functionality and code. The reCAPTCHA lib is a good example, this lets you add the popular reCAPTCHA service to your Enonic XP app. Starters is a way of kick starting the Enonic XP application development process. They provide a pre-defined project structure, build scripts, library references, sample code and sometimes even data. The Vanilla Starter lets you start off with the most basic structure, while the Gulp Starter lets you use Gulp as a task runner, and integrates it with the Gradle build and watch-flow. Visit https://enonic.com for more on Enonic XP.